Guest post by John Quayle, marketing and graphic design professional that lives and works in the greater Pittsburgh area. Admit it. During some point in our lives, we've all been there. We've all been the nervous wreck found in the corner at a networking event trying to go over our talking points for the social gathering. The more we tend to go over our notes and map out the route we'll take to talk to a few targeted attendees, the more we believe that we can turn casual conversations into life long business relationships. "HiMyNameIsJohn. DoYouKnowThatISellXYZForALiving? IHeardYourCompanyCanUseAProductLikeThat. WouldYouLikeMyCard? IThinkWeShouldMeet. WhatDayIsGoodForYou? Much to our dismay, we realize that we've just spilled our guts on the first impression, tried to sell the new connection our business or skill, and painfully experienced a miniature mental breakdown in less than 20 seconds. Unsure of how to recover, the next few moments seem to go in slow motion as we see the connection gracefully avoid the onslaught of words and begin to excuse themselves from the interaction. The new connection we've attempted to make? Severed. Houston - I think we've experienced a setback. To make matters worse, that feeling of disappointment has now taken our complete attention away from starting dialogue with other attendees. We quickly forget that the night isn't over and there is still plenty of time left to salvage a room full of opportunities. The best thing we can do is not to worry! Although we may have struck out swinging on the first pitch, we can easily learn from our mistakes and take that knowledge with us to the next event or even the next conversation. Instead of instantly trying to create a red phone hotline to new acquaintances by selling our skills or business upfront, it is always better to have things start off on a very casual note. 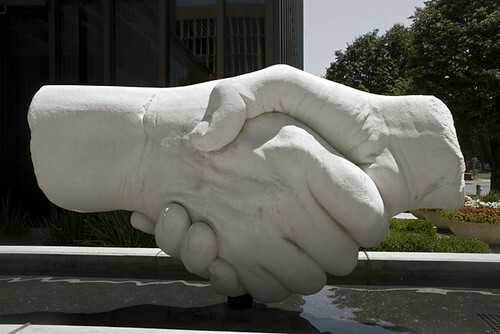 Every networker needs to remember that it takes a lot of time and energy to solidify a business relationship. One conversation isn't going to place you in the inner circle no matter how much your skills are in need. Always show respect to the people you meet. Be brief. Do not go overboard on time. Keep the use of the pronoun "I" to a bare minimum. If you're speaking to a targeted connection, lead the conversation but let them do the majority of the talking. Never ask for their business card in the beginning or the middle of a discussion - always at the end. If you walk away with their email address, think about following up with an quick email a few days later. Make a point to attend another event where you know you'll see the connection again. These seven useful tips, although helpful, are just a few of a long line of suggestions that we can abide by. It is important to note that these techniques may not work for every conversation. Depending on the event and attendees, your options might be limited. No matter what the circumstances are, I can assure you that it is in all of our best interests to calm our inner cheerleader and severe the time that we make sales pitches - lest we see our moment of potential turn into our moment of what could have been.